Plans are being drawn up for a new high-speed orbital railway connecting London's zone three suburbs in a bid to keep the capital's soaring population moving over the next few decades. 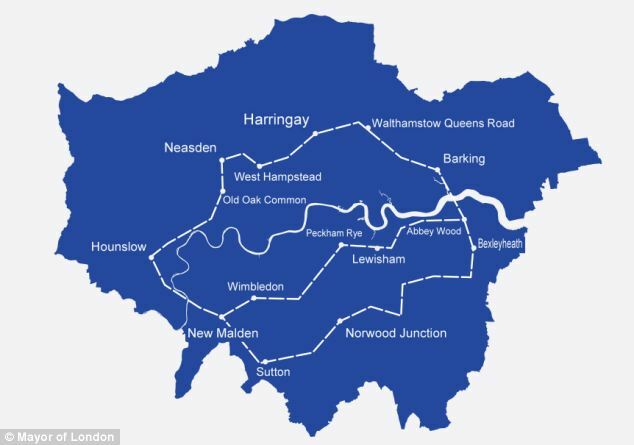 London mayor Boris Johnson revealed the scheme in his London Infrastructure 2050 plan and predicted the capital would see a population shift to the east with Barking possibly becoming the next Piccadilly Circus within 100 years time. He said about £200bn of spending on transport infrastructure alone would be needed in the capital by 2050 to keep suburbs like Barking, Walthamstow, Bexley Heath, Hounslow, Neasden and Harringay up to speed and connected with the heart of the city. The idea for an additional rail service has grown from the success of London Overground which has helped regenerate areas and decongest tube lines. 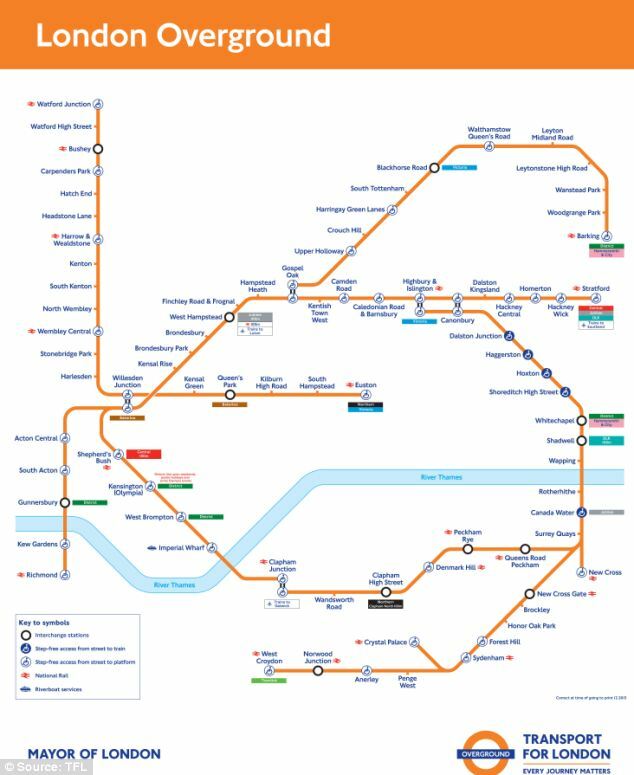 But where London Overground largely connects zone two, the orbital railway will link suburbs in zones three and four including Harringay and Barking - and even Sutton in zone five. As London's population grows over the next few decades, demand for rail transport is expected to increase by 80 per cent. Mr Johnson was in the east London borough to launch his plan, which he described as ‘a real wake-up call to the stark needs that face London over the next half century’. Barking was historically a fishing settlement on the River Roding in the county of Essex. But when the railway arrived in 1854 the 5,000 strong population was given access to other forms of work in the centre of London. And when the tube arrived in 1908, the population swelled to around 37,000, taking advantage of the suburb's transport links. The major has earmarked the area for further regeneration and the former industrial lands to the south are being redeveloped as Barking Riverside, with plans to build more than 10,000 homes. Office suites, shops and restaurants will also be built in a bid to bring more jobs to the area. But planning permission has been granted for only a fraction of that until the new rail links arrive. It is hoped the new orbital railway will bring prosperity to areas in the east that have been earmarked for new homes. Barking Riverside, a piece of former industrial land sandwiched between the A13 and the Thames, has been marked for almost 11,000 new homes but planning permission has been granted for only a fraction of that until new rail links arrive. Mr Johnson toured the new area after launching his new plans for the capital’s infrastructure. He said: ‘This will be Piccadilly Circus here in 100 years' time. And he reckons 50,000 new homes will need to be built in the capital to meet the needs of Londoners. He said: ‘Population growth is unstoppable. You've got to go with the grain of how people want to live their lives. But he ruled out building on the green belt, explaining that green infrastructure is just as important as the city’s other utilities and called for an extra 9000 hectares to be provided.